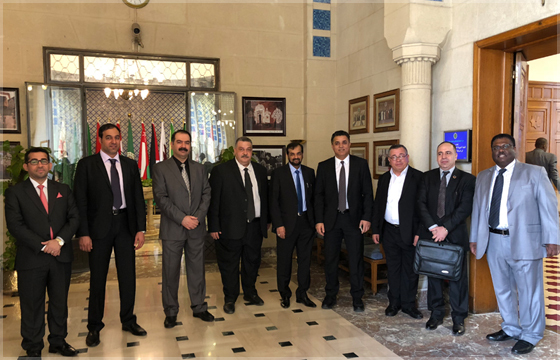 Cairo On 22 April, the National Center for Meteorology participated in the 34th session of the Permanent Arab Meteorological Committee held at the headquarters of the General Secretariat of the Arab League in Cairo with the participation of representatives of the Arab States. The Center was represented by Dr. Abdullah Al-Mandous, Director of the National Center for Meteorology and Mohamed Al-Abri, Director of Meteorology Department. Over three days, the session discussed a number of items dealing with aviation meteorology and information meteorology as well as ways of managing weather and climate risk information. It also discussed training and capacity building and the Arab climate forecasting forum, in addition to the Integrated Strategy for Arab Meteorological Services and its Operational Plan 2020-2030. The session discussed the work of the 34 ways of strengthening cooperation with the relevant authorities, including the World Meteorological Organization , the Arab, regional and international organizations as well as cooperation with regional groupings and countries in the framework of the forums.